Jump to: Footnotes & Instructions | AMC7135 notes | PT4105 notes | Schottky diodes. 396 step-down drivers found. Listed by driver name. 1 17 mm x 13 mm x 10 mm Driver chip MT7201. One of the threads highlights some inconsistency with the input and output figures - buyer beware. Last updated 22 Mar 2015. 1 29 mm x 18 mm x 10 mm Output voltage 9-11 V.
1 70 mm x 18 mm x 15 mm Efficiency is manufacturer claimed maximum, typical efficiency unknown. The stated length probably includes the LED leads. Duh. 1 35 mm x 31 mm diameter Dimmable with trim adjustment 30-800 mA. 1 25 mm x 19 mm x 18 mm Minimum input voltage is a guess. Last updated 12 Jun 2011. 1 17 mm Unknown input voltage range; even the web page title has two ranges (6-9 V and 3.0-9.5 V). Claimed 1.2 A maximum output current implies it's not a constant current driver. It's also not good considering a 1 A Schottky diode is used. Buyer beware. 5 17 mm Actual output current said to be 1100-1300 mA. Five modes, memory unknown; high, medium (50%), low (10%), fast strobe (8 Hz), SOS. Unknown regulation method, possibly just PWM modes. Compare with DX 162783. 1 20 mm Formerly product ID 9265. 5 17 mm 5 modes with memory; high, medium (50%), low (10%), fast strobe (8 Hz), SOS. Unknown regulation method - possibly just PWM modes. Polarity protection. Compare with DX 162783. 3 22 mm x 15 mm high (components on both sides) 3 mode; high, low, strobe. A momentary switch (included) cycles through modes. The minimum input voltage of 7.4 V is hopefully higher than what it will actually accept. 5 17 mm 5 modes, unknown memory; high, medium, low, fast strobe, SOS. 3 17 mm Assumed to be a linear regulator. Main chip is marked CAB1x. Three modes; high, low, strobe. 3 17 mm 3 mode; high, low, slow strobe. Unknown regulation method, assumed to be a linear regulator not just a PWM driver. 5 17 mm 5 mode; high, medium, low, fast strobe, SOS. Unknown regulation method, assumed to be a linear regulator not just a PWM driver. 1 60 mm x 30 mm x 30 mm Output voltage 3-6 V. Output power 10 W; output current is a wild guess. Comes with 4 LEDs per driver, 8 total. Designed for angel eye replacements for BMW. 1 66 mm x 25 mm x 20 mm Output voltage 3-10 V. IP67 dust/water rating. 1 43 mm x 24 mm x 8 mm Unknown main chip; it has been sanded. Last updated 18 Mar 2015. 1 17 mm Incomplete specifications given. Said to be a Cree XM-L driver but only has an output of 1 A. 5 17 mm 5 mode with memory; high, medium, low, strobe, SOS. Polarity protection, low voltage warning. Current regulation method unclear - buyer beware. 1 29 mm x 18 mm x 10 mm Output voltage 9-10 V.
1 23 mm x 19 mm x 14 mm Product removed from site; probably replaced by the 1-6x 1W driver. 1 17 mm Linear regulator using 1x AMC7135 chip. Polarity protected. See extra AMC7135 notes below. 1 5 mm x 4 mm x 2 mm Single AMC7135 linear regulator chip (10 pack). Note - surface mount. See extra AMC7135 notes below. 1 5 mm x 4 mm x 2 mm Single high output AMC7135 linear regulator chip (100 pack). Note - surface mount. See extra AMC7135 notes below. 1 5 mm x 4 mm x 2 mm Single high output AMC7135 linear regulator chip (10 pack). Note - surface mount. See extra AMC7135 notes below. Last updated 14 Mar 2014. 1 20 mm star board Linear regulator using 1x AMC7135 chip mounted on a LED star. Polarity protected. See extra AMC7135 notes below. 1 20 mm star board Linear regulator using 1x AMC7135 chip mounted on an LED star board. See extra AMC7135 notes below. Includes a generic 1 W warm white LED. 1 20 mm Linear regulator using 1x AMC7135 chip. Polarity protected, low voltage protection. See extra AMC7135 notes below. 1 17 mm Linear regulator using one AMC7135 chip (thus the pictured driver is not this one). Note that the claimed input voltage doesn't allow for the polarity protection diode; the correct figures are listed in this table. See extra AMC7135 notes below. 1 18 mm x 14 mm x 10 mm Output current is assumed. Unknown driver chip. Typical MR16 bulb driver but without the pins. 1 Output voltage 3-4 V. Unknown driver size. Includes 2 LG warm white LEDs. Includes 2 LG cool white LEDs. 1 18 mm x 14 mm x 10 mm Uses CL6807 driver chip (see notes on CL6807 below). There's a nice review of the driver on the site. 1 17 mm Clearance price $13.39. Linear regulator using AMC7135 chip. See extra AMC7135 notes below. Last updated 13 Sep 2012. 3 22 mm x 12 mm high Update Jan 2016: Some changes made to the driver, unknown what change to specs these have. 3 mode; high, low, fast strobe. Output current said to be 2500-3000 mA. Assumed to be suitable for 1-3 LEDs. Driver fitted with a couple SS34 Schottky diodes. Possibly the same as Lights Castle 530016. An alternative is DX sku.57779. 5 22 mm 5 modes, unknown memory; high, medium, low, strobe, SOS. Polarity protection. 5 21 mm x 10 mm high - two boards in double layer Buck driver with components on both sides of main board. Larger dummy board for battery contact. 5 modes in 2 groups without memory; low (5%), medium (50%), high (100%), strobe, SOS. Alternate group by half press. Low voltage warning at 3.0 V and 5.8 V.
Last updated 24 Nov 2018. 3 22 mm x 16 mm high - two boards in double layer Driver removed from site. 3 modes; high, low (20%), strobe. Low soltage protection, reverse polarity protection. Presumably the same as DX sku.57779. 5 25 mm 5 modes, unknown memory or relative levels; high, medium, low, fast strobe, SOS. Minimum input voltage is a guess. Efficiency is manufacturer claim. 4 22 mm 4 modes; high, medium, low, strobe (long press for 3 seconds). 1 16 mm Unknown regulation method - possibly none, just PWM. Unknown modes. Output voltage 3.2-3.8 V.
Includes a Cree XM-L (T6 bin) cool white LED. 1 16 mm Unknown regulation method - possibly none, just PWM. Unknown modes. Output voltage 3.2-3.8 V. Output voltage 3.2-3.8 V.
Includes a Cree XM-L2 (T6 bin) cool white LED. Includes a Cree XM-L (T6 bin) cool white LED on a copper base. Includes a Cree XM-L (T4 bin) warm white LED on a copper base. 1 17 mm Linear regulator using 2x AMC7135 chips. Polarity protected. See extra AMC7135 notes below. 1 17 mm Linear regulator using 2x AMC7135 chips. Polarity protected (assumed to be Schottky diode). See extra AMC7135 notes below. 1 17 mm Go for the cheaper DX sku.26109 if you don't want the polarity protection diode. 1 17 mm Linear regulator using 2x AMC7135 chip. Polarity protected. See extra AMC7135 notes below. Apparently has a capacitor instead of a diode, so no polarity protection. 1 17 mm Buyer beware: As of September 2012 these are still being sent out with both 2xAMC7315 and 3xAMC7135. As of November 2012 (and maybe earlier) DX's description says 700 mA. Latest version: TR-025 (again). Three AMC7135 chips with space on the board for a fourth. Previously: Caution: The TR-0050 (also labelled as TR-0025) has replaced the TR-025. It is a different board and ships with only 2 or 3 AMC7135 chips and for some reason a capacitor between battery positive and battery negative. Does not have a polarity protection diode. See extra AMC7135 notes below. TR-025 (discontinued): Apparently a four AMC7135 linear current regulator but identifying marks have very roughly been removed for photos. Claims to provide different current outputs (1-1.2 A) to different Cree efficacy bins. I think NOT. Last updated 30 Sep 2014. 1 20 mm star board Linear regulator using 2x AMC7135 chips mounted on LED star. Polarity protected. See extra AMC7135 notes below. 1 17 mm Linear regulator using 2x AMC7135 chips. Polarity protected, low voltage protection. See extra AMC7135 notes below. 1 17 mm Linear regulator using two AMC7135 chips (thus the pictured driver is not this one). Note that the claimed input voltage doesn't allow for the polarity protection diode; the correct figures are listed in this table. See extra AMC7135 notes below. 1 17 mm Linear regulator. Also see DX sku.26109. See extra AMC7135 notes below. Last updated 14 May 2012. 1 17 mm Very incomplete specs given, and specs given in the title are bad (mA/h is non-sensical). Three modes with no mode memory; low (unknown %), high, strobe. 5 17 mm - two boards in double layer Buck driver using PWM for modes, although what exactly the modes are seems to vary - high, low, slow strobe, fast strobe, and either SOS or beacon (1 flash every 8 or 10 seconds). High is 700-1000 mA depending on input voltage. Apparently based on PT4105 chip - see separate notes below - and may be able to cope with higher input voltage. 5 16 mm Unknown regulation method; no inductor so assumed to be just PWM, possibly with output smoothing using a capacitor. 5 modes, 3 of which are flashing; high, low, slow strobe, fast strobe, SOS. However, reviewers describe different sets of modes, such as high, medium, low, strobe, SOS; or high, low, slow strobe, fast strobe, 10 second beacon flash. Photos posted show a different IC to DX's photos. Tip: This board may possibly operate as a straight-forward PWM driver if the capacitor is removed. Last updated 1 Aug 2011. Linear regulator using three AMC7135 chips and a micro controller for PWM mode control. 4 modes with memory; firefly (3-4 mA), medium (200 mA), high, strobe. Modes are changed normally (forward clicky recommended) or by using a code to select the mode you want. Polarity protection. Low voltage protection; at 3.3V the current will drop to 2 mA, and switches off within 3 seconds of hitting ~2.9 V - unclear if this is a designed feature or just the way the AMC7135 works. PWM speed >4 kHz. Comes with spring on positive terminal and a ground wire on the top of the board. See extra AMC7135 notes below. My thoughts: This driver seems quite expensive just to get a fiddly way of changing modes. Maybe it'll serve someone well, but with only 4 modes, changing modes normally with a reverse clicky would require just as many button pushes on average and require less thinking. Changing to firefly mode when the battery voltage drops to 3.3 V is unnecessarily conservative - from the last Li-ion cells I tested it would be at just under half their capacity. 2 17 mm Driver removed from site. Linear regulator using three AMC7135 chips and a micro controller for PWM mode control. 2 modes with memory; ramping mode (user settable 1-100%), strobe. PWM frequency 3.7 kHz. Low voltage protection; at 3.3V the current drops to 8mA and turns off when it gets to ~2.9 V - unclear if this is a designed feature or just the way the AMC7135 works. Comes with spring on positive terminal. 1 21 mm x 12 mm high - two boards in double layer Top board diameter 19 mm. PWM frequency 700 Hz. Thermal protection. Low voltage protection (I think that's what "run multhium battery protection" means). 1 16 mm Stupidly, this driver completely vanishes from the retailer's web site when temporarily out of stock. SKU 1060. Buck driver. Unknown driver chip. 1 95 mm x 39 mm x 24 mm Output voltage 30-36 V.
1 18 mm x 14 mm x 10 mm Uses CL6807 driver chip (see notes on CL6807 below). Efficiency figures driving 2-3 LEDs with rectifier diodes bypassed. 1 13 mm x 13 mm x 12 mm Output current is assumed. Said to be for red and yellow LEDs; no mention of output voltage. 5 21 mm x 10 mm high - two boards in double layer 5 modes with memory; low (10%), medium (50%), high (100%), strobe, SOS. Disappointingly slow PWM frequency, 122 Hz. Low voltage warning and protection. 1 26 mm x 14mm high - two boards in double layer Thermal protection. 1 Said to be suitable for Cree XM-L. Probably the same as DX sku.57779. Last updated 28 Oct 2012. 3 22 mm x 14 mm high - two boards in double layer 3 modes; high, low, fast strobe. Regulation appears to be reasonably good. Modification for single mode and test results for 1 to 3 LEDs are on CPF here. An alternative is DX sku.128269 or Lights Castle 530016. 3 19 mm x 8 mm high 3 modes; low (10%), high, medium (35%). Recommended use with maximum 12 V input. 3 22 mm x 14 mm high - two boards in double layer Incomplete specs - buyer beware. Possibly the same as DX sku.57779 (which is cheaper). Size listed here assumes that. 5 17 mm x 10 mm high - two boards in double layer 5 modes with memory; high, medium, low, strobe, SOS. Alternate group with no flashing modes accessed by half press. 8 17 mm x 10 mm high - two boards in double layer 8 modes in 4 groups, with memory; medium (30%), beacon strobe (10 Hz twice, 2-second pause), fast strobe (7 Hz), SOS. Alternate groups with no flashing modes accessed by half press. 1 20 mm Output voltage 3.2-3.8 V. Note: This driver has the same specs as FT sku.1677800, just no photos. Includes a Cree XR-E (Q3 bin) cool white LED. 1 17 mm Uses PT4115 driver chip (see notes on PT4115 below) with SS14 Schottky diodes and a 220µF capacitor. Last updated 31 Mar 2015. 1 23 mm x 19 mm x 14 mm Output voltage range is so tight it can't be used to drive three red or amber LEDs. 1 17 mm Linear regulator using 3x AMC7135 chips. Polarity protected. See extra AMC7135 notes below. 1 15 mm Linear regulator using 3x AMC7135 chip. See extra AMC7135 notes below. Apparently has a capacitor instead of a diode, so no polarity protection. 5 17 mm Linear regulator using three AMC7135 chips and a ATtiny13V for PWM mode control. 5 modes with memory, with solder pads allowing different mode groups to be selected; low (5%), medium (30%), high, fast strobe, SOS. This is more expensive than the apparently identical DX sku.6190. A slightly cheaper version without memory is DX sku.127686. See extra AMC7135 notes below or this CPF thread. Last updated 22 Sep 2015. 1 15 mm Buyer beware - DX has changed this driver several times. Linear regulator, apparently a three two? AMC7135 board but identification marks on the chips have been removed for the photo. What would normally be a standard polarity protection diode actually looks like a capacitor between battery positive and battery negative. See extra AMC7135 notes below. Originally claimed to provide different current outputs (0.7-1 A) to different Cree efficacy bins. I think NOT. Last updated 7 Nov 2013. 3 17 mm The description for how this thing works is a big fat lost-in-translation mystery. Possibly 3 modes; programmed brightness, strobe, random mode (can be set to any brightness 0-100%). There's also a "tactical mode" mentioned which involves a half press... of what? Two-stage low voltage protection; with poor quality Li-ion cells the first stage (output drops to 8 mA) will cut in at less than 2/3 the battery capacity. Polarity protection. See extra AMC7135 notes below. 16 17 mm Uses three AMC7135 linear regulator chips and possibly an ATtiny13V for PWM modes; 16 modes in 3 groups, including one with no flashing modes. Claimed in different places to be both 16 and 17 modes. Space on the board for a 4th AMC7135. Appears to be exactly the same as KD S009743, which is cheaper. See extra AMC7135 notes below. Last updated 20 Nov 2012. 16 17 mm Uses three AMC7135 linear regulator chips and possibly an ATtiny13V for PWM modes; 16 modes in 3 groups, including one with no flashing modes. Claimed in different places to be both 16 and 17 modes. Space on the board for a 4th AMC7135. Appears to be exactly the same as KD S003214, which is more expensive. Formerly product ID 10996. Also available in a 5 pack, S009744 (formerly product ID 10997). 19 17 mm Linear regulator using three AMC7135 chips and a PWM mode controller. Claimed 19 modes in 3 groups. Note that the pictures provided are of a standard 3x AMC7135 board with no mode controller - buyer beware - hence unknown polarity protection; input voltages stated here are without that diode, and the typical 5.5 V maximum for a microprocessor mode controller. See extra AMC7135 notes below. 2 17 mm Linear regulator board using 3 AMC7135 chips and a microcontroller for PWM modes; high, low (15%). Mode memory. Alternate mode groups may be selectable by using the star-shaped contacts, as detailed here. A review is here. See extra AMC7135 notes below. Formerly product ID 1801. Also available in a 5 pack, S004660 (formerly product ID 1802). Also available in a 20 pack, S006268 (formerly product ID 6052), but with the low mode possibly just 50 mA (a detail which has been lost with KD's last site update). 4 17 mm 4 modes; low (3-4 mA), medium (200 mA), high, strobe. Two-stage low voltage protection; with poor quality Li-ion cells the first stage (output drops to 2 mA) will cut in at less than 2/3 the battery capacity. Polarity protection. See extra AMC7135 notes below. 5 17 mm Linear regulator using 3x AMC7135 chips. 5 modes; high, medium, low, strobe, SOS. Polarity protected. See extra AMC7135 notes below. 5 17 mm Linear regulator using three AMC7135 chips with an MCU for PWM modes and a polarity protection diode. 5 mode; high, medium, low, strobe, SOS. 5 17 mm Linear regulator using three AMC7135 chips (formerly listed as having four) and an ATtiny13A for PWM mode control. Five modes - high, medium, low, strobe, SOS. Alternate mode groups can be selectable by using the star-shaped contacts, as detailed here. See extra AMC7135 notes below. 5 17 mm Linear regulator using three AMC7135 chips and a ATtiny13A for PWM mode control; PWM frequency >4500 Hz. 5 modes with memory; low (5%), medium (30%), high, strobe, SOS. Alternate mode groups can be selected by using the star-shaped contacts; low/high/strobe, low/medium/high, low (10%)/high. Low voltage warning at 2.9-3.0 V. See extra AMC7135 notes below. 5 17 mm Linear regulator using 3x AMC7135 chips. 5 modes in 4 groups. Polarity protected. See extra AMC7135 notes below. 5 17 mm Update September 2015: These are reported to now have an ascending mode order. Three AMC7135 chips with a chip to provide PWM modes. 5 modes without memory, with solder pads allowing different mode groups to be selected; high, medium (30%), low (5%), strobe, SOS. (Note the descending order.) There is a 2 mode group of high and low (10%). Polarity protected. Alternative is DX sku.127689 (ascending mode order with memory). See extra AMC7135 notes below or this CPF thread. Last updated 23 Sep 2015. 5 20 mm Driver removed from site. Linear regulator using three AMC7135 chips and a ATtiny13A or similar providing PWM modes; PWM frequency >4.5 kHz. 5 modes with "several hour" memory, with solder pads allowing different mode groups to be selected; low (5%), medium (30%), high, strobe, SOS. Alternate mode groups can be selected by using the star-shaped contacts; low/high/strobe, low/medium/high, low (10%)/high. Low voltage protection at 2.8 V. See extra AMC7135 notes below. 1 17 mm Linear regulator using 3x AMC7135 chips. Polarity protected, low voltage protection. See extra AMC7135 notes below. 1 20 mm Linear regulator using 3x AMC7135 chips. Polarity protected, low voltage protection. See extra AMC7135 notes below. 1 17 mm Linear regulator using three AMC7135 chips (thus the pictured driver is not this one). Note that the claimed input voltage doesn't allow for the polarity protection diode; the correct figures are listed in this table. See extra AMC7135 notes below. Last updated 22 Oct 2012. 1 17 mm Linear regulator with three AMC7135 chips. Polarity protection assumed to be using a Schottky diode (providing 0.3 V drop). 1 15 mm Linear regulator using three AMC7135 chips. No polarity protection. 1 15 mm x 15 mm x 10 mm Uses CL6807 driver chip (1A max, 0.1V sense voltage, dimming pin). 1 27 mm x 17 mm x 9 mm Output voltage not stated, probably 8-11 V. Removed from website. Last updated 18 May 2015. 17 17 mm Update Nov 2012: Two different versions of this driver are being shipped, a 101-AK-A1 and an AK-47A with the four star contacts like DX sku.127689. The functionality might be unchanged. Linear regulator using three AMC7135 chips and a PWM mode controller (ATtiny13V running the PWM at 4.7 kHz); includes a group with three well-spaced modes and no flash or strobe! Now with 17 modes. I got slightly different timing on the third group though, and call them different things - low (10%), medium (35%), high (100%), fast strobe, police strobe, beacon (1 flash per 3.5 sec), fast beacon (1 flash per 1.4 sec), slow beacon (1 flash per 11 sec), SOS (1 set per 11 sec). The latest boards have an empty space all ready for a 4th AMC7135. They may also have low battery detection - see here. See extra AMC7135 notes below. Tip 3: Methods for wiring this board in parallel with another AMC7135 board are described here, with lots of colourful diagrams. Tip 4: Modes can be disabled by following the instructions in this thread. 19 17 mm Formerly 2 mode. Linear regulator board using three AMC7315 chips and probably a PIC12F629 for PWM mode control. Has a group with high/medium/low without flash or strobe. Low mode 120 mA. Note that the claimed input voltage doesn't allow for the polarity protection diode, which is confirmed by the mention that it operates best over 3.5 V; the more likely correct figures are listed in this Driver List table. See extra AMC7135 notes below. 20 17 mm Linear regulator using three AMC7135 chips and a PWM mode controller. See extra AMC7135 notes below. 3 17 mm Uses three AMC7135 linear regulator chips and ATtiny13V for PWM modes - low, medium, high according to gunga, not the other way around. Is not 1.2 A output as claimed, but you might get 1.1 A. Changing the mode group may also be possible using the contacts on the bottom of the driver board. See extra AMC7135 notes below. Formerly product ID 1694 and 8020. 5 17 mm (maybe 15 mm - see tip 3) Linear regulator using three AMC7135 chips and a ATtiny13V for PWM mode control. 5 modes with memory; the claimed high, medium (35%), low (20%), strobe, SOS is actually low (5%), medium (30%), high, strobe, SOS according to brted's review and harlxw's test results (in the same thread), which means it appears to be the same as DX sku.127689 except cheaper. A version without memory is DX sku.127686. Alternate mode groups can be selected by using the star-shaped contacts, as detailed here. Unknown why maximum voltage is specified at only 4.5 V instead of 5.5 V for the ATtiny13V (5.8 V with a Schottky polarity protection diode). See extra AMC7135 notes below or this CPF thread. Tip 3: One user reports he was able to sand it down to 15 mm diameter. 1 17 mm Linear regulator with three AMC7135 linear regulator chips and a silicon polarity protection diode (0.6 V drop on the chip enable pin). This board comes with one AMC7135 connected and the other two just needing small solder bridges - very useful for using a switch instead of the solder bridges to change from 1/3 amp to 2/3 amp or 1 amp. The solder bridges are the yellow dots in this picture by PaulH (see CPF thread). Also (formerly) available as a 20 pack. See extra AMC7135 notes below. Last updated 5 Mar 2014. 3 17 mm x 15 mm high - two boards in double layer Driver removed from site. Three modes; high, medium (30%), low (5%). Thermal protection, low voltage warning. 1 17 mm Linear regulator using 4x AMC7135 chips. Polarity protected (assumed to be Schottky diode). See extra AMC7135 notes below. 7 17 mm Claimed 380 mA per each of 4 AMC7135 linear regulator chips. 7 modes in 8 groups determined by binary combinations of 3 solder bridges; ultra-low (3-5 mA) [why? ], medium (35%), high, strobe (10 Hz), slow strobe (2 Hz), SOS, beacon. Mode memory determined by another solder bridge. Low voltage warning at 2.8 V, claimed minimum 2.5 V; the AMC7135 datasheet says 2.7V minimum. No short circuit protection, no reverse polarity protection. Also available as a 5 pack, S020076. 1 17 mm Linear regulator using 4x AMC7135 chip. Polarity protected (assumed to be a Schottky diode). See extra AMC7135 notes below. 3 17 mm Stupidly, this driver completely vanishes from the retailer's web site when temporarily out of stock. SKU 1218. 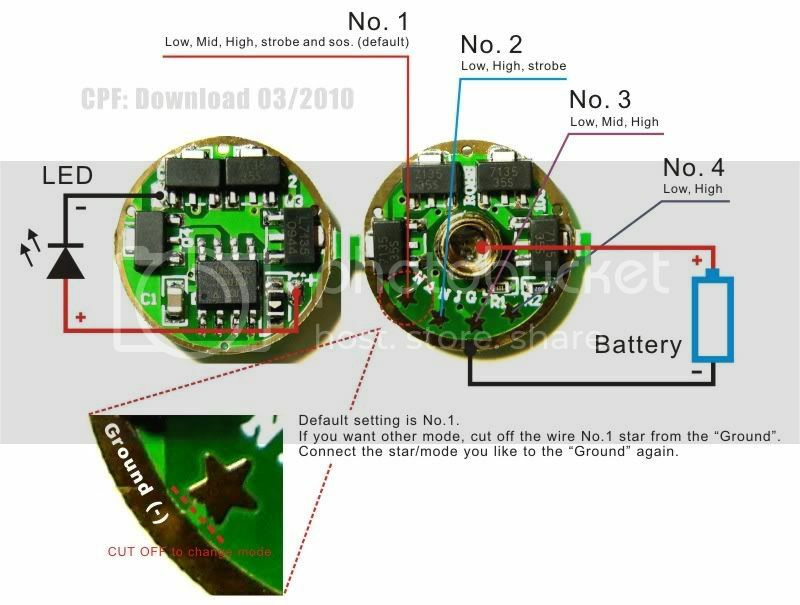 Buyer beware - the claim to be a "buck circuit board" (formerly claimed to be boost/buck driver) is clearly false, since it has four AMC4135 linear regulators plus an ATtiny13A PWM controller giving three modes - claimed low (60 mA), medium (440 mA), high (1.4 A); formerly claimed low (120 mA), medium (350 mA), high (1.4 A); tested low (60-80 mA), medium (440-450 mA), high (1420 mA). May be able to be converted to 5 modes by removing a solder bridge. See extra AMC7135 notes below. The URL of this driver used to be what was claimed to be a 5 mode buck/boost driver. This 3 mode driver is double listed on their site. 5 17 mm Incomplete specifications given. The "1560mAh" in the title and "1560mAh current" under the heading "Hightlight" are meaningless, other than being typical of the site. Linear regulator using four AMC7135 chips and a ATtiny13A for PWM mode control. See extra AMC7135 notes below. Default is 5 modes - low (2%), medium (28%), high (100%), strobe, SOS. Can also be set to 3 modes (low, medium, high) using a solder bridge. 5 17 mm Linear regulator using four AMC7135 chips and a ATtiny13A for PWM mode control at >4.5 kHz. Five modes with memory; low (5%), medium (30%), high, strobe, SOS. Flashing modes can be eliminated with a solder bridge. See extra AMC7135 notes below. 5 17 mm Linear regulator using 4x AMC7135 chips. 5 mode; high, medium, low, strobe, SOS. Can be converted to 3 mode with a solder bridge. Polarity protected. See extra AMC7135 notes below. 1 20 mm Linear regulator using 4x AMC7135 chips. Polarity protected, low voltage protection. See extra AMC7135 notes below. 1 17 mm Linear regulator using 4x AMC7135 chips. Polarity protected. See extra AMC7135 notes below. 1 17 mm Linear regulator using four AMC7135 chips (thus the pictured driver is this one). Note that the claimed input voltage doesn't allow for the polarity protection diode; the correct figures are listed in this table. See extra AMC7135 notes below. 5 17 mm Linear regulator using four AMC7135 chips with an MCU for PWM modes and a polarity protection diode. 5 modes with mode memory; low (5%), medium (30%), high, fast strobe, SOS. Polarity protection assumed to be using a Schottky diode (providing 0.3 V drop). Last updated 1 Nov 2017. 1 17 mm Four AMC7135 chips with a polarity protection diode. The 3.0-4.5 V range mentioned by DX is unnecessarily restrictive but fits with a single Li-ion cell plus 0.3 V for a Schottky diode providing the polarity protection. 1 46 mm 3 modes; high, low, flash. Buyer beware: The details says it's intended for a particular Cree LED luminous flux bin and a non-specific Cree LED suffix - simply nonsense (or Chinese code for "we don't have a clue about LEDs"). A reviewer says he got 5.5A with fresh cells, dropping down to 3.15A at 3.7V. Last updated 18 Dec 2018. 1 28 mm x 17 mm x 9 mm Unknown operation method; presumed to be buck driver. Claimed output voltage 12-18 V, which would be impossible to do even with 12 V AC with just buck, implies buck/boost; this is almost certainly not the case. Driver comes with a bridge rectifier so it can be used with AC. Appears to be the same as DX 66271. 1 27 mm x 18 mm x 10 mm Output voltage 3-15 V.
1 17 mm Single mode. 3 17 mm 3 mode; high, low, fast strobe. Polarity protection. 5 17 mm 5 modes with memory; high, medium, low, fast strobe, SOS. Low voltage protection. Has 4xAMC7135 (1.4 A) but originally claimed the output of 6xAMC7135 (2.1 A), now claims only 1.2 A - buyer beware. Big spring (relatively speaking) on back of board. 1 17 mm Linear regulator using four AMC7135 chips. See extra AMC7135 notes below. Formerly also available as a 15 pack (which for some reason changed from a 10 pack). 1 17 mm Incomplete and non-sensical specifications given - output current a guess. The specs that are provided are the same as DX sku.26110. 1 17 mm x 15 mm high - two boards in double layer Driver removed from site. Actual output current tested at 4450 mA at input voltage 4.2 V (this may have been limited by resistance of test probes - see discussion thread). 5 17 mm Linear regulator using 5x AMC7135 chips. 5 modes in 4 groups; low (5%), medium (30%), high (100%), strobe, SOS. Alternate groups switched with star contacts. Low voltage warning. Polarity protected. See extra AMC7135 notes below. 1 20 mm Linear regulator using 5x AMC7135 chips. Polarity protected, low voltage protection. See extra AMC7135 notes below. 3 22 mm x 14 mm high 3 mode; high, low, fast strobe. Possibly the same as DX 128269. 1 18 mm x 14 mm x 13 mm Output current is assumed - buyer beware. 7 17 mm Claimed 380 mA per each of 6 AMC7135 linear regulator chips. 7 modes in 8 groups determined by binary combinations of 3 solder bridges; low (3-5 mA), medium (35%), high, strobe (10 Hz), slow strobe (2 Hz), SOS, beacon. Mode memory determined by another solder bridge. Low voltage warning at 2.8 V, claimed minimum 2.5 V; the AMC7135 datasheet says 2.7V minimum. No short circuit protection, no reverse polarity protection. Also available as a 5 pack, S020065. 7 17 mm Note that the low end of the claimed input voltage range will not produce the desired output current. Low mode 50mA (for 3-5 mA see KD S020064). Last mode memory with solder bridge. Low voltage warning at 2.8 V.
5 17 mm Linear regulator using six AMC7135 chips and a ATtiny13A providing PWM modes; PWM frequency >4500 Hz. 5 modes with memory; low (5%), medium (30%), high, strobe, SOS. Alternate mode groups can be selected by using the star-shaped contacts; low/high/strobe, low/medium/high, low (10%)/high. Low voltage warning at 2.9-3.0 V. See extra AMC7135 notes below. 5 17 mm Linear regulator using 6x AMC7135 chips. 5 modes; low (5%), medium (50%), high (100%), strobe, SOS. Alternate group reached with half press of power button; low, medium, high. Low voltage warning. Polarity protected. See extra AMC7135 notes below. 5 17 mm Linear regulator using 6x AMC7135 chips. 5 modes in 4 groups; low (5%), medium (30%), high (100%), strobe, SOS. Alternate groups switched with star contacts. Low voltage warning. Polarity protected. See extra AMC7135 notes below. 5 17 mm 5 modes with memory; high, medium, low, fast strobe, SOS. Low voltage protection. Claimed output 2.2 A but it seems to simply be a normal 6xAMC7135 board. 5 17 mm Linear regulator using 7x AMC7135 chips. 5 modes in 4 groups; low (5%), medium (30%), high (100%), strobe, SOS. Alternate groups switched with star contacts. Low voltage warning. Polarity protected. See extra AMC7135 notes below. 1 17 mm Incomplete specs provided. From the pictures it looks like it's based on the Zetex C310 chip. Size stated in this table is an educated guess. In the 3rd photo, focusing the camera on the wires sticking out the back might be arty but isn't very useful. 1 17 mm Not a linear regulator as claimed - it has an inductor. The claimed test figures are extremely dodgy; input @ 4.2 V is 1.09 W, output is at least 2.27 W for a white LED - buyer beware. They are also the same figures used for 1114502. 5 17 mm 5 modes; high, medium, low, rapid (strobe? ), SOS. The claimed test figures are extremely dodgy; input @ 4.2 V is 1.09 W, output is at least 2.27 W for a white LED - buyer beware. They are also the same figures used for 1114501. 1 21 mm x 17 mm x 13 mm Output current is from the discussion post. If true there is an inconsistency between the input and output current figures - buyer beware. 12 17 mm with components on both sides Available from CPF member vestureofblood. 12 modes in 4 groups, with and without memory (varies by group); various combinations of ramping, low (2%), medium (25%), high, strobe, SOS, beacon, medium (15%). Low voltage warning. Voltage indication when entering beacon mode. 5 17 mm with components on both sides Limited availability from CPF member download. Multimode board with four AMC7135 linear regulators on each side (8 total) and an ATtiny13A for PWM mode control. Mode group selectable by connecting star pads on the board, like an AK-47. 5 modes in default group; low (0.13 A), medium (0.93 A), high (2.8 A), strobe, SOS. See extra AMC7135 notes below. May have sold a previous 3 mode version like this; high (2.8 A), medium (1 A), low (0.3 A). Make your own - fun! 1 17 mm Instructions for making your own version. Actual price will vary depending on what boards you use to make it - modes can be included if desired. See extra AMC7135 notes below. 9 17 mm Linear regulator using eight high output AMC7135 chips at 380 mA each. 9 distinct modes in 4 groups, with memory. Claims no high pitch noises and no visible flicker. Polarity protection, low voltage warning and protection. See extra AMC7135 notes below. 6 17 mm Linear regulator using eight AMC7135 chips and a ATtiny13A for PWM mode control; PWM frequency >4500 Hz. 5 modes with memory; low (5%), medium (30%), high, strobe, SOS. Alternate mode groups can be selected by using the star-shaped contacts; low/high/strobe, low/medium/high, low (10%)/high. Low voltage warning at 2.9-3.0 V. See extra AMC7135 notes below. 9 17 mm Driver removed from site. Linear regulator using eight high output AMC7135 chips at 380 mA each. 9 distinct modes in 4 groups, with memory. Claims no high pitch noises and no visible flicker. Polarity protection, low voltage protection. See extra AMC7135 notes below. See p-710 for updated version. 7 17 mm Claimed 380 mA per each of 8 AMC7135 linear regulator chips. Up to 7 modes in each of 8 groups determined by binary combinations of 3 solder bridges; low (aka "firefly", 3-5 mA), medium (35%), high, strobe (10 Hz), slow strobe (2 Hz), SOS, beacon. Mode memory determined by another solder bridge. Low voltage warning at 2.8 V, claimed minimum 2.5 V; the AMC7135 datasheet says 2.7V minimum. No short circuit protection, no reverse polarity protection. Also available as a 5 pack, S020074. 1 17 mm Note that the low end of the claimed input voltage range will not produce the desired output current. Low mode 50mA (for 3-5 mA see KD S020073). Last mode memory with solder bridge. Low voltage warning at 2.8 V.
5 17 mm Linear regulator using eight AMC7135 chips. 5 modes in two groups; low (5%), medium (15%), high, strobe, SOS. Polarity protected. The stated input voltage range is a little high at the top end; 5.5 V for the ATtiny13 and about 0.3V for the polarity protection Schottky diode. See extra AMC7135 notes below. 5 17 mm Linear regulator using 8x AMC7135 chips. 5 modes in 4 groups; high, medium, low, strobe, SOS. Alternate groups switched with star contacts. Low voltage warning. Polarity protected. See extra AMC7135 notes below. 5 17 mm Linear regulator using eight AMC7135 chips and an ATtiny13A to control PWM modes. 5 modes with memory; low (5%), medium (30%), high, fast strobe, SOS. Selectable mode groups set by solder bridge on the stars. Polarity protection assumed to be using a Schottky diode (providing 0.3 V drop). Low voltage warning. 5 17 mm Linear regulator using 8x AMC7135 chips. 5 modes in 4 groups; low (5%), medium (30%), high (100%), strobe, SOS. Alternate groups switched with star contacts. Low voltage warning. Polarity protected. See extra AMC7135 notes below. 5 17 mm Linear regulator using 8x AMC7135 chip. 5 mode; low (5%), medium (30%), high, fast strobe, SOS. Polarity protected. See extra AMC7135 notes below. 5 17 mm 5 modes in 2 groups with memory; low (5%), medium (50%), high, strobe, SOS. Alternate group with no flashing modes accessed by half press. Low voltage warning. Last updated 19 Apr 2016. 1 17 mm Updated version: This is a Nanjg 105C without the PWM controller board to give modes. Polarity protection. Why the previous price was so much more expensive than the 5 mode version is beyond my guessing ability. Previous version: This is just two 4x AMC7135 boards connected back to back. See extra AMC7135 notes below. Warning: Even with the product update the page still contains a full size 6 megapixel image - pretty typical for KD's stupid site. 1 17 mm Linear regulator using eight AMC7135 chips. Single mode. Apparently a Nanjg 105C board with no mode controller. 3 17 mm with components on both sides Stupidly, this driver completely vanishes from the retailer's web site when temporarily out of stock. SKU 1217. Multimode board with a PWM mode controller and eight AMC7135 linear regulators (four on each side of the board). 3 modes with memory; low 140 mA, medium 1 A, high 2.8 A (formerly listed as 2.5 A). Claimed input voltage of 2.8-6.0 V doesn't allow for the polarity protection diode; the more likely correct figures are listed in this Driver List table. The output of AMC7135 chips varies a little, so high might be as much as 2.8 A (as mentioned here and here). Also pictured in this post and this post. 5 17 mm Linear regulator using eight AMC7135 chips. 5 modes; unstated what they are. Apparently a Nanjg 105C board; if so it has selectable mode groups (by solder bridge on the stars). Low voltage warning - when battery voltage is less than 2.9-3.0 V it changes to low mode and flashes once each second. Polarity protection assumed to be using a Schottky diode (providing 0.3 V drop). 5 17 mm (measured, not stated) March 2012: Driver has been removed from site (as has the 5 pack). See KD sku S020073 for a replacement. Incomplete specifications given. Uses 8 AMC7135 linear regulator chips with either a PIC12F629 microcontroller for modes, or an ATtiny13A for the 105C model (which is apparently the latest version). Modes are determined by the stars on the board - they provide AK-47 functionality (where a group of modes is hardwired using a solder link). Has the same basic mode groups as CPF user download's very similar driver (diagram here) except their order for the 105A is high (100%), medium (35%), low (4%). When low mode is started there is a momentary bright flash, and after about 2.5 seconds there's a very brief dropout (or "blink") that indicates the mode has been fixed - after that, switching off momentarily will not change the mode. Reviews written for 105 and 105A. As of Jan 2011 the 105C is being shipped. The maximum voltage in this table is based on the microcontroller's maximum of 5.5 V plus 0.6 V for the polarity protection diode. If it's a Schottky diode the maximum voltage is actually 5.8 V.
Tip: The circuit track for the first star does not need to be broken for the other stars to work. Formerly product ID 10995. Also available as a 5 pack, S009835 (formerly product ID 11088). Last updated 15 May 2012. 5 17 mm Driver removed from site. Linear regulator using eight AMC7135 chips and a ATtiny13A for PWM mode control; PWM frequency >4500 Hz. 5 modes with memory; low (5%), medium (30%), high, strobe, SOS. Alternate mode groups can be selected by using the star-shaped contacts; low/high/strobe, low/medium/high, low (10%)/high. Low voltage warning at 2.9-3.0 V. See extra AMC7135 notes below. 1 17 mm Linear regulator using eight AMC7135 chips. Polarity protection. See extra AMC7135 notes below. 5 17 mm 5 mode; high, medium, low, strobe, SOS. Can change to 2-3 modes using stars on back. The star on the right gives high, medium, and low with no blinking modes. Last updated 21 Jul 2015. 1 43 mm x 24 mm x 8 mm Apparently intended for a 10W (3s3p) LED array. 1 26 mm x 16 mm high - two boards in double layer Driver removed from site. 3 modes; low (10%), medium (30%), high. (The right order and no flashing modes - yay!) 12 V recommended maximum input voltage. Thermal protection and low voltage protection for 2 Li-ion cells. 1 26 mm x 17 mm x 10 mm Buck regulator based on PT4115 chip. Unclear what current rating the diodes have; assumed to be 1 A. Sense resistors 0.2 Ω and 0.3 Ω in parallel. Output voltage 9-11 V. Includes AC rectifier. MR16 prongs not included. 1 17 mm Components on both sides of board, no centre battery terminal. There are an awful lot of components on that board for a single mode buck driver. Incomplete/inadequate specifications listed - unknown current regulation, unknown if the driver will step up the voltage if it's too low. The 1.3 A "maximum" implies it's not a constant current driver. Buyer beware. 1 42 mm x 32 mm x 12 mm The URLs linked below have all been reused for various LED products, but the drivers may still be listed on their site elsewhere. Good luck finding them. Incomplete specifications on manufacturer's and retailer's web sites (incompetent manufacturer? ); output voltage/LED quantities unknown. However, by using the wizard on the manufacturer's site it appears they'll do 1-4 LEDs. The claimed maximum 91% efficiency is very good, if true, especially since the drivers (except the 1,400 mA) have a rectifier built in. Even if maximum efficiency is up there however, it's probably not representative of typical efficiency, especially since they all claim the same (except for the 500 mA version which claims 92%) - unlikely across the whole current output range. Soft start. PWM dimming with 0-10 V input or potentiometer. Available in versions with outputs of 350, 500, 700, 1,000 and 1,400 mA. 1 5 mm x 5 mm x 2 mm Driver removed from site. Single AMC7135 linear regulator chip; no board. Actual output of any particular chip is in the range 340-380 mA; this one should be close to 350 mA. See extra AMC7135 notes below. 1 5 mm x 5 mm x 2 mm Five single AMC7135 linear regulator chips; no board. Actual output of any particular chip is in the range 340-380 mA. See extra AMC7135 notes below. 1 5 mm x 5 mm x 2 mm Five AMC7135 linear regulator chips; no board. Actual output of any particular chip is in the range 340-380 mA; these should be close to 380 mA. See extra AMC7135 notes below. 1 25 mm x 14 mm high Output voltage up to ~14 V, output power up to ~70 W. Overhead ~1 V. Maximum claimed efficiency listed here; typical efficiency for any particular configuration unknown. Thermal protection. External PWM input. 1 25 mm x 14 mm high Output voltage up to ~14 V, output power up to ~120 W. Overhead ~1 V. Maximum claimed efficiency listed here; typical efficiency for any particular configuration unknown. Thermal protection. External PWM input. 1 Output voltage 0.7-3.3 V. SOT-223 surface mount package. From the claimed specs it is apparently not an AMS1117-3.3 (datasheet) which has an output current of 1 A, not the 200 mA claimed. 1 65 mm x 26 mm x 24 mm Output voltage 9.0-10.5 V. Intended for 3s3p LED arrays. 3 23 mm Limited availability from CPF member download. Uses the popular AX2002 chip; this seems to be the only AX2002 driver available with modes. Present, designation J: 3 modes; low (50 mA), medium (200 mA), high (1 A). No memory. A few of these have been sold pre-configured to 1.4 A. Previously, designation H: 3 modes; high (1 A), medium (200 mA), low (30 mA). Has memory. 17 mm diameter. Input voltage 3.6-23 V, 1-6 LEDs. Claimed 0.25 V headroom (the amount input voltage must be above output voltage); this is probably actually the feedback voltage (the voltage dropped across the current set resistor) - other AX2002 drivers have ~0.5 V headroom. It may be able to be set the output current up to 2 A, the rating for the AX2002. Last updated 8 Nov 2012. 1 16 mm Output current stated to be 700-1000 mA; horrendous regulation! 8 25 mm Buck regulator. Constant current out 350-1000 mA (user reconfigurable) at up to 24 V, uController UI. Thermal and polarity protection included. 1 28 mm 1.5 V overhead. External on/off input. Soft start. Efficiency claimed is maximum; typical efficiency unknown. Thermal protection. 1 17 mm Buyer beware - these are not the AX2002 drivers claimed. They actually use a voltage regulator chip with a varying output current. See DX sku.3256. Last updated 17 Feb 2018. 1 17 mm Update Feb-Mar 2015: Buyer beware - the drivers shipped are not the drivers pictured (photos have since been updated); the claimed details (bizarrely taken from the DX site) do not apply. Actually uses a chip marked LEDA 1412 with a SS24 diode and a couple of transistors. The output current is not the 925 mA claimed, but instead varies from 820 mA for one LED to 600 mA for three LEDs in series. Previously: Appears to be identical to the popular DX sku.3256... and even uses DX's description. 1 17 mm x 6 mm high Update Feb-Mar 2015: Buyer beware - DX has posted new photos which shows the same driver as FT sku.1105800. The claimed details are no longer correct; this driver is sadly no longer recommended. Also, the output current is no longer constant, varying from 820 mA with one LED down to 600 mA with three LEDs in series. This a a very sad change. Update Nov 2009: New version using AX2002; now constant current output with 0.27 Ω set resistor, slightly larger diameter. Overhead is ~0.52 V. Test data and discussion here. Tip: The output current can be increased (or decreased) by changing the set resistor appropriately (Rset = 0.25 / current) but the diode is a Schottky SS14, which has a maximum current limit of 1 A. Inexpensive 3 A Schottky diodes are listed here or here (if you want to risk that site). Old version: 16 mm diameter. The details still on the DX site are for this version. Buck regulator using Zetex C310. 800-1000 mA output dependent on input voltage, although a hack for lower output is explained here. When run at lower output it appears reasonably constant current regulated. Test data graph. Last updated 17 Nov 2017. 1 Output voltage 3-4 V. Unknown driver size. Unknown driver output current. 1 20 mm x 20 mm x 11 mm Available in many different forms, each with four versions with outputs of 350, 500, 700 or 1,000 mA. Half the forms are designed for low voltage AC, half for DC. Some forms have a built in trim adjustment for 40-110% output, some allow for an external trim adjustment. External connections vary - some forms have the wires built in, while most have from pins (4-7 of them) for PCB mounting. Wiring harnesses are also available, with and without potentiometer for trim adjustment. An additional capacitor across the input may be needed to smooth input power, as described here. This retailer (3023; wired version) has good prices and a driver selector tool to help sort out all the varieties. Good luck. Last updated 16 Apr 2012. 1 19 mm x 10 mm diameter Input voltage must be at least 2 V higher than output voltage. Output has short circuit protection (15 seconds) and open circuit protection. Efficiency is greater the more LEDs it's driving. 1 63 mm x 24 mm x 10 mm Output voltage 9-12 V. Intended for 3s3p LED arrays. IP67 dust/water rating. 5 25 mm x 21 mm high Suitable as a driver/pill replacement for a C8 torch. 5 modes, mode group selectable with solder bridge. Includes a cool white Cree XM-L in a brass pill. 1 57 mm x 31 mm Common Anode Multichannel. Powers 3 LED channels with a common anode, up to a maximum power of 25 W per channel. Output current on each channel can be set at 350 mA, 700 mA, or 1000 mA, and dimmed separately using PWM or DC inputs. Reverse polarity protection. Maximum claimed efficiency listed here; typical efficiency for any particular configuration unknown. 4 channel version also available. 1 57 mm x 31 mm Common Anode Multichannel. Powers 4 LED channels with a common anode, up to a maximum power of 25 W per channel. Output current on each channel can be set at 350 mA, 700 mA, or 1000 mA, and dimmed separately using PWM or DC inputs. Reverse polarity protection. Maximum claimed efficiency listed here; typical efficiency for any particular configuration unknown. 3 channel version also available. 1 25 mm x 20.3 mm Buck regulator. Constant current output at up to 16 V. Headroom 1 V.
1 25 mm x 20.3 mm Buck regulator. Constant current output 700 mA or 1000 mA, at up to 16 V. Headroom 1.3 V.
1 45 mm x 27 mm DIP switch to control speed. Output current is estimate only. 5 25 mm - two boards in double layer Buck regulator using PWM for modes. Double layer board; the 1 mode version plus a mode controller. 5 modes, the order of which multiple users report to be; medium, low, high, strobe, SOS. One user has reported the "strobe" mode is actually a 50% duty cycle flash. No mode memory: "Every switch on, no matter how long or short advances the mode, and if it's left off for more than a minute or two it goes back to full-bright." Claimed constant current output at 2.8A but many buyers have reported the output is not well regulated and/or much lower than the rated output current - around 2.0 A and as low as 1.9 A. Buyer beware! Last updated 25 Nov 2011. 1 25 mm 4th version February 2011: Reported to be equipped with SS34 Schottky diode and provide 2400 mA output. Possibly QX5241A driver chip. 3rd version September 2009: Said by techjunkie to be "a stinker". 2nd version March 2009: Buck regulator, driver chip number obscured/removed. Claimed constant current output at 2.8A but no one has got more than 2260 mA. Techjunkie says it's now well regulated. The Schottky diode used has a current rating of just 2 A. 1st version: Users reported the output current of the older version was not well regulated, and several others reported much lower than the rated output current (as low as 1950 mA was reported). From work techjunkie did here it seemed the driver may have been mainly a voltage regulator not a current regulator. This would allow it to work in parallel but not significantly increase output current. The actual output current would depend on LED Vf, so it's hard to be sure what you'll get. He also said the diameter is actually 26 mm. Last updated 31 Dec 2012. 3 19 mm Three modes at high, medium (30%), low (10%). Its only reviewer says it needs heatsinking or it will burn out. Buyer beware. Formerly product ID 5595. Also available in a 5 pack, S006371 (formerly product ID 6282). 5 17 mm Unknown regulation method. 5 modes; high, medium low, strobe, SOS. 5 20 mm x 11 mm high 5 mode with memory; high, medium (25%), low (5%), strobe, SOS. Low voltage warning for 1 or 2 Li-ion cells. 3 25 mm x 25 mm x 15 mm 3 modes without memory; high, medium, low. 5 17 mm x 7 mm high - two boards in double layer 5 modes; high, medium (50%), low (10%), strobe (8 Hz), SOS. 4 26 mm x 13 mm high For a while (around May 2012) this driver was at a clearance price. The driver is back up to its normal price and is still available. 4 modes; high, medium (50%), low (25%), SOS. 1 20 mm x 12mm high - two boards in double layer 5 modes, no memory; high, low (10%), medium (30%), strobe (8 Hz), SOS. Note that the diameter stated in the title and description was 17 mm (for almost 2 years). 5 17 mm x 6 mm high - two boards in double layer Five modes, weird mode order; medium (30%), low (8%), high, strobe (8 Hz), SOS. 4 23 mm Incomplete specifications given. I believe this is designed for a DRY torch (host available) with 3x XM-L in series, run from 3x Li-ion in series. Buyer beware - do not use this driver with unprotected Li-ion cells in that host. 4 modes with memory; low (0.1 A), medium (0.5 A), high (2.25 A), turbo (direct drive, maximum 4-5 A). Turbo mode steps down to high mode after 20 seconds. 1 26 mm x 13 mm high Available direct from a CPF member. Input cut-off voltage is 4.5 V but output current will decrease under 6 V input. 1 23 mm x 13 mm high Available direct from a CPF member. Input cut-off voltage is 4.5 V but output current will decrease under 6 V input. Output current adjustable with potentiometer, in the range 0.5-9.0 A (or possibly 0.5-5.0 A). Input voltage must be at least 2V above output voltage. 1 31 mm x 9 mm high Formerly called H5CC. Suitable for SST-50. Output current variable from 20 mA up to 6.7 A. Overhead is 1.0 V at 5 A output. Not suitable for connecting multiple drivers in parallel. First 20 units have a maximum input of 20 V. Information thread here. 5 33 mm Features uController UI, "User menu reconfigurable to 1400mA/­2000mA/­2800mA/­3600mA/­5000mA/­5600mA or 6600mA at any time." Ships configured for 1.4 A output. Input voltage needs to be at least 1 V higher than output voltage (at 2.8 A). 1 Product is labelled "AC12" and hence DX description says it accepts 12 V. Output current stated on driver is likely an error and should probably be 330 mA. Output 2-5 V.
1 blue LED included (in a fancy aluminium holder). 5 20 mm x 17 mm high - two boards in double layer Five modes - medium (30%), low (10%), high (100%), 9 Hz strobe, SOS. 1 28 mm Limited supply. Buck regulator. Constant current output 2.8 A. Headroom 0.5 V. Thermal protection, polarity protection. Single mode but can be driven using a separate PWM driver. 1 36 mm Buck regulator, can drive up to 22 V of series connected LEDs. Constant current output user reconfigurable at any time to 1.0/1.4/2.0/2.4/2.8 A. Headroom 0.5 V @ 2.8 A. Thermal protection, polarity protection. 5 17 mm x 7 mm high - two boards in double layer 5 modes in an unusual order; high, medium, strobe, SOS, low. The driver is claimed to be 700 mA but the test data listed gives about 3 A: "We have been testing multiple drivers from multiple batches, and results repeatedly show ~3A output, while the manufacturer insists 0.7A." - buyer beware. The test data indicates output current drops with less than 4.5 V input, but one of the reviews says it went up to 3.94 A with two Li-ion cells. With the other review saying his one just glowed and died with a funny smell, this is a driver for masochists. 5 26 mm Output voltage 3-3.7 V. Specs elsewhere indicate input voltage is 3-18 V, and output current may be any where from 3 A to 5 A - buyer beware. Probably 5 modes; low (10%), medium (50%), high, strobe, SOS. Includes a Luminous SST-50 warm white LED. 5 32 mm Output voltage 3-3.7 V. Specs else where indicate input voltage is 3-18 V and output current 7 A - buyer beware. Probably 5 modes in Impractical Reverse Order; high, medium (50%), low (10%), strobe, SOS. Includes a Luminous SST-90 warm white LED. Last updated 23 Nov 2018. 4 22 mm x 19 mm high Buyer beware - originally listed with many conflicting specs. Output current 0.8-1.5 A (which sounds very unregulated). Output voltage 3.0-8.4 V sounds suspiciously like an input voltage for 1 or 2 Li-ion cells. Output supposedly suitable for 1 or 3 LEDs. 4 mode; high (1.5 A), medium (1.2 A), low (0.8 A), fast strobe. Polarity protection. 4 28 mm Buyer beware - may actually be a boost driver with much less than 6 A output. 4 mode with 3 second memory; high (6 A), medium (4 A), low (2 A), fast strobe. Formerly claimed 5 modes, including "Close" (SOS?). Formerly claimed to be suited for 1 to 3 LEDs in series. Formerly claimed 30 mm diameter. Output voltage 3.3-10 V. Polarity protection. Appears to have LEDs for indicating battery voltage. For a 4 A version see DX sku.231788. 4 30 mm Buyer beware - appears to be designed for two separate LEDs at ~1 A and ~1.5 A, not a single LED at 4 A total. 4 mode with 3-second memory; high (4 A), medium (2 A), low (0.1 A), fast strobe. Formerly claimed 5 modes, including "Close" (SOS?). Output voltage 3.3-10 V. The board looks like it has places for battery indicator LEDs but they are populated with resistors. Polarity protection. For a 6 A version see DX sku.231936 or for a 4 A version with battery status LEDs see DX sku.236160. Last updated 20 Mar 2015. 4 28 mm 4 mode with 3 second memory; high (4 A), medium (2 A), low (100 mA), fast strobe. Formerly claimed 5 modes, including "Close" (SOS?). Output voltage 3.3-10 V. Polarity protected. There are two battery status LEDs are on the board. 1 36 mm x 31 mm Maximum output voltage 50 V. Output open circuit and short circuit protected; reverse polarity protected. Supports external potentiometer for dimming. Vin must be at least 2 V greater than Vf. 1 20 mm Output voltage 3.2-3.8 V.
Includes a Cree XP-G (R5 bin) warm white LED. 3.0-12 V 1-4 4x NiMH "is probably the best configuration available"
2 26 mm The specs for this driver listed in this table may not be correct, as incomplete specs are listed in the sales thread and the specs thread isn't linked from it. (It might be this one but it has conflicting specs from the few that are actually listed in the sales thread.) Different versions are available, with high mode 5 A, 8 A or 10 A, and low mode from 1.2 A up. Switching between modes required a toggle switch or potentiometer (not included). Driver draws 0.5 mA when off. 1 75 mm x 10 mm x 6 mm Output voltage 9.0-9.5 V. Dimmable, 1.5-5.0 V control signal. Buyer beware - claims to be a boost driver, and output current is suspect. 1 28 mm x 17 mm x 11 mm Driver chip probably MC34063A (which has a 1.5 A maximum and is specified for DC-DC converters, not constant current LED drivers), with SS14 Schottky diodes. Said to be suited for 2 series, 2 parallel LEDs; it can probably handle 1-3 LEDs just fine. 1 29 mm x 18 mm x 10 mm Output voltage 9-11 V. Driver chip MC34063A (which has a 1.5 A maximum and is specified for DC-DC converters, not constant current LED drivers). Driver comes with SS14 Schottky diodes. 1 29 mm x 18 mm x 11 mm Output voltage 9-11 V.
One blue 3s3p LED array included. One cool white 3s3p LED array included. One warm white 3s3p LED array included. 1 29 mm x 18 mm x 12 mm Output voltage 9-12 V. Driver chip MC34063A, which has a 1.5 A maximum (and is specified for DC-DC converters, not constant current LED drivers). Driver comes with SS14 Schottky diode. 1 28 mm x 18 mm x 11 mm Output voltage 3-4 V. Driver chip MC34063A, with SS14 Schottky diode. 1 17 mm Buck regulator based on PT4105 chip. Constant current output. Off the shelf it's set to 750 mA, but this can be changed by using a different set resistor (original is soldered surface mount). Input voltage needs to be 1-3 V above output. Can output 1 A with more than 9 V in, but at an efficiency cost. 1 20 mm Buck regulator based on PT4105 chip. Constant current output. Off the shelf it's set to 1000 mA (even though that's out of spec for the regulator chip below 9 V in) but this can be changed by using a different set resistor (original is soldered surface mount). Input voltage needs to be 1-3 V above output, but the new components will shut the board down under 6.2V (2x Li-ion?). This thread discusses the control features of this new version. Efficiency perhaps as low as 60% thanks to running it out of spec and it also runs quite hot because of it. In summary, more versatile but not as useful. 1 17 mm November 2011: The present Kennan may be version 4; input voltage range previously claimed to be 3.6-23 V, now 4-18 V. It's still a good driver but it's more expensive than it needs to be, so no longer recommended. Consider KD sku S009736 or DX sku.26110 instead. Buck regulator based on AX2002 chip. Constant current output, off the shelf set to 1 amp. Efficiency figures from AX2002 datasheet, but "AX2002" test results I've seen that may be of this board indicates 78-87% for a single LED below 1.4 A, sagging to 65% at 2.4 A. Note: In italianboy's review (apparently lost with the Nov 2011 KD site update) he claims that 1 amp is outside the driver chip's limits. This is not true as the AX2002 can actually cope with 2.5 amps, although it will get very hot over 2 amps, meaning without heatsinking the thermal protection will probably turn it off after just a few minutes. Also, the other components on the Kennan 3 board may not be too happy at 2+ amps; the Schottky diode is an SS14, which has a 1 A limit. The Case 1 and Case 2 examples mentioned on KD's site mention the 750 mA that an earlier Kennan driver was set to. 1 18 mm Driver board with combined LED - Seoul P4 U2 (cool white). Board has 12 V maximum on it, but spec sheet shows 18 V maximum. Seems identical to L30.4 except for an extra hole on the L30.4. Seems identical to L30.3 except for an extra hole on the L30.4. 1 15 mm Driver board with combined LED Cree XP-G R5 (cool white). 1 15 mm Driver board with combined LED Cree XP-E R3 (outdoor white) for a narrower beam than the standard L312. 1 15 mm Driver board with combined LED Cree XP-G R4 (neutral white). 5 17 mm x 8 mm high - components on both sides Driver removed from site. 5 modes with memory; high (1 A), medium (300 mA), low (50 mA), strobe, SOS. Modes use PWM. Low voltage warning; light will slowly flash at 3.3 V (which seems very conservative) and 6.2 V.
5 19 mm x 9 mm high - two boards in double layer Driver removed from site. 5 modes with memory (claims to not use PWM); high (2.5 A one cell, 2.8 A two cells), medium (700 mA), low (100 mA), strobe, SOS. Constant current output with two cells. Low voltage protection, at 3 V/5.8 V; drops to low mode and starts flashing. 5 24 mm x 15 mm high - components on both sides 5 modes with memory; high, medium (700 mA), low (100 mA), strobe, SOS. Change to alternate group with no flashing modes with momentary switch push at the right time. Low voltage warning at 9 V and 12 V. Also available from Intl Outdoor Store p-489. 5 24 mm x 15 mm high - components on both sides Driver removed from site. 5 modes with memory; high (2.5-2.6 A), medium (700 mA), low (100 mA), strobe, SOS. Two mode groups, featuring a group without flashing modes. Does not use PWM. Low voltage warning; light will slowly flash at 9 V and 12 V.
3 17 mm x 10 mm high 1 mode and 3 mode versions; high, medium (750 mA), low (50 mA). Always starts in high (great shame). Output voltage up to 6.6 V. Polarity protection. For some reason is described as suitable for 2x XP-G2 in series (rated at 1500 mA) / 2x XP-E2 in series (rated at 1000 mA). The response from the shop is that those LEDs can be run that hard and modders completely ignore maximum ratings now. An XP-E2 at 2.4 A? Why? He's taken leave of his senses. Buyer beware. 1 43 mm x 23 mm x 9 mm "Designed for 10W High Power LED" doesn't quite say how many LEDs it's for, so the 1-3 in this table is only a guess. The specifications for this driver are suspiciously similar to a mains driver from the same retailer. Buyer beware. 3 19 mm Three modes - low (5%), high (100%), medium (35%). Switches to low mode on over-temperature. Output claimed to be constant current and either 3.0 amps or 2.8 amps. Input variously listed at 5.5-15 V (with <12 V preferred), 5.5-13.2 V, and 4.0-12.0 V. 90-95% efficient seems to be the default claim by this retailer. The claim to provide 1+ hours of 3 A output from four Eneloop cells is clearly false for a Cree MC-E or SSC P7. With a LED Vf of 3.4 V (MC-E) that's 10.2+ Wh output from less than 8.5 Wh input (Eneloop @ 2.25 A, assumed driver 95% efficient for estimating battery voltage under load). This also raises doubt about the constant current claim. Buyer beware. 1 24 mm x 24 mm Driver has been removed from retailer's web site. Actual output current may vary from 240 mA to 310 mA. Possibly a clearance product; claim to have free shipping could not be verified. 1 24 mm x 24 mm Driver has been removed from retailer's web site. Actual output current may vary from 650 mA to 710 mA. 1 25 mm x 25 mm "1 W LED Driver Based on MBI6651". Although claimed to be "constant current" the output current drops the more LEDs it's driving and rises the higher the input voltage. Claimed efficiency @ 12 V input with 3 LEDs. 1 25 mm x 25 mm "3 W LED Driver Based on MBI6651". Although claimed to be "constant current" the output current drops the more LEDs it's driving and rises the higher the input voltage. Claimed efficiency @ 12 V input with 3 LEDs. 1 25 mm x 25 mm "5 W LED Driver Based on MBI6651". Although claimed to be "constant current" the output current drops the more LEDs it's driving and rises the higher the input voltage. Claimed efficiency @ 12 V input with 3 LEDs. 1 25 mm x 25 mm Driver has been removed from retailer's web site. Although "constant current" the output current drops the more LEDs it's driving and rises the higher the input voltage. Claimed efficiency @ 12 V input with 3 LEDs. 1 25 mm x 25 mm "0.5 W LED Driver Based on MBI6651". Although claimed to be "constant current" the output current drops the more LEDs it's driving and rises the higher the input voltage. Claimed efficiency @ 12 V input with 3 LEDs. 1 54 mm x 26 mm Apparently a voltage-controlled driver with the output voltage set using a potentiometer; output voltage 1.5-22 V (use that potentiometer with care). There's an implication this driver should be used with a resistor in series with the LEDs. Claimed "max 700 mA, peak 2 A" is contradictory. Built-in rectifier for AC or DC operation. Unknown operation method but thought to be a linear regulator because of the presence of a large heat sink on the board. 1 25 mm x 18 mm x 5 mm 1 V overhead. Efficiency listed is maximum; typical efficiency unknown. Reverse polarity protection, soft start. 1 29 mm x 17 mm x 5 mm 1 V overhead. Dimming by PWM with an onboard RISC chip(!) or with DC input signal. Efficiency listed is maximum; typical efficiency unknown. Reverse polarity protection. 1 63 mm x 30 mm x 20 mm Output voltage 3-10 V. IP67 dust/water rating. Suitable for 3S3P LED arrays. 1 121 mm x 39 mm x 39 mm 1-12 LEDs on each of three 350 mA channels. Conflicting specifications, 48 V max input in title, but 24 V max input in description. Manual also says 48 V. Can be used with RGB controller. 1 121 mm x 39 mm x 39 mm 1-12 LEDs on each of three 700 mA channels. Manual. Can be used with RGB controller. 1 100 mm long Buck regulator, not specifically a LED driver but is an inexpensive way to get a low voltage LED driver working with 12 V. Designed to plug into a car lighter socket to provide a USB socket. Constant voltage output 5.5 V (not actually within USB spec, which is maximum 5.25 V). Can do somewhere around 700-1000 mA before dropping out of regulation. Cute little red LED to show it's working. Tip: Does not charge iPods but there is a work-around using a couple of resistors to apply a mid-voltage to the two data pins. Last updated 3 Apr 2014. 3 8 mm high - two boards in double layer Unknown diameter - buyer beware. 3 modes; high (100%), medium (50%), low (10%). Thermal protection, low voltage protection. 5 8 mm high - two boards in double layer Unknown diameter - buyer beware. 3 modes; high (100%), medium (50%), low (10%), 10 Hz strobe, SOS. Thermal protection, low voltage protection. 12 17 mm Designed to be used with common positive multi-colour RGBW LEDs such as this 4 colour MC-E or a dynamic white MC-E. Four channel; 600-700 mA per channel. 12 modes in 2 groups; change group by soldering/switching stars. See p-687 for 20 mm version. 12 20 mm Driver removed from site. Designed to be used with common positive multi-colour RGBW LEDs such as this 4 colour MC-E or a dynamic white MC-E. Four channel; 600-700 mA per channel. 12 modes in 2 groups; change group by soldering/switching stars. See p-686 for 17 mm version or p-645 for a single group 20 mm version. 8 20 mm Driver removed from site. Microcontroller with 4 D882 transistors; unknown regulation quality. Designed to be used with common positive multi-colour RGBW LEDs such as this 4 colour MC-E. Output current is 4x 700 mA. 8 modes without memory; white, red, green, blue, white-red-green-blue strobe, red-blue police strobe, white strobe, red SOS. 1 17 mm double sided board (formerly 19 mm) It's hard taking KD's site seriously when so many random colours and sizes of text is used to describe the board, with missing graphics liberally distributed as well. (The site has since been updated.) Inconsistent specifications, with output current listed as 2.8 A and 3.0 A and input voltage listed as 5.5-15 V and 4.0-12.0 V. Three mode; low (5%), high (100%), medium (35%) - also listed as high (2.8 A), medium (1.38 A [49%]), low (0.25 A [9%]). The runtimes given don't stack up. There are two versions (with 3 and 5 modes) which look identical and either might be sent to fill an order. Buyer beware. This driver gets a bad review here. StefanFS here says it gets really hot with 8 AA cells, while CM here calculates over 2 W of heat dissipated in high mode - toasty - while showing the claimed 90-95% efficiency is imaginary. Appears to be the same as e-lectronics sku 464. 5 19 mm Uses PWM for 5 modes; low (10%), medium (50%), high (100%), fast strobe, SOS. If driving a Cree MC-E its four dice must be parallel connected. Also available as a 5 pack. Both product pages have photos of two different drivers. Buyer beware. This driver gets a bad review here. 1 23 mm 1 V overhead. External PWM input. Efficiency claimed is maximum; typical efficiency unknown. 1 23 mm 1 V overhead. Efficiency claimed is maximum; typical efficiency unknown. Report from a reader: "I have tested it [for] hundreds hours, no problems and no need to heatsink for 2 LEDs with 9 V."
1 16 mm x 7.5 mm x 3 mm Linear regulator based on a LM317 voltage regulator chip, with a rectifier so it can cope with AC (and can be connected either way with DC). Available in nine versions providing 10 mA, 20 mA, 30 mA, 40 mA, 50 mA, 60 mA, 70 mA, 80 mA and 100 mA. Supply voltage needs to be at least 3.8 V higher than total LED Vf and not more than 38, 27, 18, 14, 12, 10, 9, 8 or 7 V higher respectively for the different versions. Efficiency figures are given for a single LED but could theoretically be as high as 90% for a string. 1 16 mm x 7.5 mm x 3 mm Linear regulator based on a LM317 voltage regulator chip, available in nine versions providing 10 mA, 20 mA, 30 mA, 40 mA, 50 mA, 60 mA, 70 mA, 80 mA and 100 mA. Supply voltage needs to be at least 2.5 V higher than total LED Vf and not more than 37, 27, 18, 14, 12, 10, 9, 8 or 7 V higher respectively for the different versions. Efficiency figures are given for a single LED but it could theoretically be as high as 93% for a string. 1 17 mm Output drops out of regulation below 4.5 V input, which probably means 1 V overhead. Efficiency claimed is maximum; typical efficiency unknown. 1 Product removed from retailer's site. Slightly dodgy specs. Claimed output voltage 2.2-2.4 V is probably wrong. Built-in rectifier, so can be used with AC. Last updated 13 Aug 2012. 1 19 mm x 14 mm x 13 mm Built-in rectifier, so can be used with AC. Output voltage 3.2-3.6 V. Built-in rectifier, so can be used with AC. 1 18 mm x 14 mm x 14 mm Dodgy specs that suspiciously mirror DealExtreme mistakes. Built-in rectifier, so can be used with AC. 1 28 mm x 18 mm x 8 mm Output voltage 3-10.5 V. Driver chip MC34063A, which has a 1.5 A maximum (and is specified for DC-DC converters, not constant current LED drivers). Driver comes with SS14 Schottky diode. Last updated 1 Jul 2014. 1 28 mm x 18 mm x 8 mm Buyer beware - specs are contradictory (1-3x1W or 650 mA?). Output voltage 3-10 V. Driver chip MC34063A, which has a 1.5 A maximum (and is specified for DC-DC converters, not constant current LED drivers). Driver comes with SS14 Schottky diode. Last updated 5 Jul 2014. Slightly dodgy specs. Claimed output voltage 2.2-2.4 V is probably wrong, since it also claims to drive 3 LEDs. Built-in rectifier, so can be used with AC. 1 15 mm x 14 mm x 14 mm Built-in rectifier, so can be used with AC. 1 28 mm x 18 mm x 8 mm Unknown operation method; presumed to be buck driver. Claimed output voltage 12-18 V, which would be impossible to do even with 12 V AC with just buck, implies buck/boost; this is almost certainly not the case. Driver chip MC34063A, which has a 1.5 A maximum (and is specified for DC-DC converters, not constant current LED drivers). Driver comes with SS14 Schottky diode, and a bridge rectifier so it can be used with AC. Appears to be the same as DX 178343. 1 28 mm x 18 mm x 8 mm Output voltage 10-12.5 V. Driver chip MC34063A, which has a 1.5 A maximum (and is specified for DC-DC converters, not constant current LED drivers). Driver comes with SS14 Schottky diode. 1 28 mm x 18 mm x 8 mm Claimed output voltage 9-12 V, which implies 4 LEDs but it's unclear if this is the case, and if so, how many volts DC input it will need. Driver chip MC34063A, which has a 1.5 A maximum (and is specified for DC-DC converters, not constant current LED drivers). Driver comes with SS14 Schottky diode. Available in the "More Options" link in the product page for $4.90. 1 27 mm x 24 mm x 9 mm Incomplete and/or stupid specifications given. Looks like it has a built-in rectifier, so can be used with AC. 1 18 mm x 14 mm x 10 mm Output current is a guess. Includes 3x 1W red LEDs mounted on a 50 mm diameter board. 1 25 mm x 14 mm x 11 mm Incomplete specifications given. MC34063A driver chip, which has a 1.5 A maximum (and is specified for DC-DC converters, not constant current LED drivers). Unknown input voltage range (12 V AC is about 17 V DC). Presumably it can drive 3 LEDs because it's called a "3W" driver. Built-in rectifier, probably four Schottky SS14 diodes. There are MR16 sockets available for them - round (17 mm diameter) and rectangular (28 mm x 17 mm). Tip: If using DC you wouldn't need the rectifier so you could short that out for a few percent efficiency gain, but it will still work with it left intact. 1 18 mm x 14 mm x 11 mm (31 mm x 18 mm x 11 mm including prongs and output terminals) Buck regulator based on PT4115 chip and Schottky SS14 diode. Earlier version EQB8L chip. They're not quite equivalent as the PT4115 will turn off under 8 V and the EQB8L will still work under 4 V (voltages not including the rectifier on this driver). Constant current out 330 mA - 370 mA (average 350 mA in this table); there's no difference between the two 1 W versions except maybe the set resistor (R270 for 370 mA or R300 for 330 mA). Built-in rectifier, normally four Schottky SS14 diodes. Tip: If using DC you wouldn't need the rectifier so you could short that out for an estimated 97% efficiency, but it will still work with it left intact. Last updated 14 Mar 2015. 1 18 mm x 14 mm x 11 mm (31 mm x 18 mm x 11 mm including prongs and output terminals) Buck regulator based on PT4115 chip and Schottky SS14 diode. Earlier version EQB8L chip. They're not quite equivalent as the PT4115 will turn off under 8 V and the EQB8L will work under 4 V (voltages not including the rectifier on this driver). Maximum voltage listed is from max rating for output capacitor. Constant current out 650-700 mA. Built-in rectifier, normally four Schottky SS14 diodes. The PT4115 version is said to be quite good with one and quite good or excellent when driving two or more (unfortunately the test results to which I had linked have been withdrawn pending further investigation). For automotive use (~12V) the EQB8L version of this 3 W driver is not very efficient when driving only one LED, but quite good with two (84%); thus the EQB8L seems better suited to lower currents with single LEDs. There are a couple reports of this version emitting RF noise causing interference with car radios and remote locking, but most users haven't found any interference. Tip: If using DC and sure of polarity you wouldn't need the rectifier so you could short that out for an extra 4-6% efficiency gain, but it will still work with it left intact. 1 18 mm x 14 mm x 11 mm (31 mm x 18 mm x 11 mm including prongs and output terminals) Buck regulator based on PT4115 chip and Schottky SS14 diode. Earlier version EQB8L chip. They're not quite equivalent as the PT4115 will turn off under 8 V and the EQB8L will still work under 4 V (voltages not including the rectifier on this driver). Maximum voltage listed is from max rating for output capacitor. Constant current out 330 mA to 370 mA (average 350 mA in this table); there's no difference between the two 1 W versions except maybe the set resistor (R270 for 370 mA or R300 for 330 mA), but efficiency is unknown when running a 3 LED configuration. Built-in rectifier, normally four Schottky SS14 diodes. 1 18 mm x 14 mm x 14 mm Buck regulator based on the discontinued PT4105 chip - see separate notes below. Constant current out 320-350 mA for 1 W versions, 650-700 mA for 3W version (not 320-350 mA as stated). These drivers have their own bridge rectifier using low-voltage Schottky diodes, so they can handle (low voltage) AC or DC input. While these drivers are claimed to handle 12-16 V AC, the PT4105 is only specified to handle up to 18 V input, so allowing for perhaps 0.4V drop on each of two Schottky diodes being used at any time in the rectifier, anything over about 13.7 Vrms AC would be outside the PT4105 spec. Tip: If using DC you wouldn't need the rectifier so you could short that out, but it will still work (slightly less efficiently) with it left intact. Last updated 4 Jul 2011. 1 26 mm Buyer beware. Unknown output voltage. Intended for use with a Cree MT-G2 but that LED is available in three voltage options - 6V, 9V and 36V. The claimed 18V output doesn't make sense. (The MT-G2 does have an 18W power rating.) If the 1000mA output current is correct this could only suit the 6V or 9V versions, as the 36V version is rated for 500mA. Also, the claimed input voltage is 12-15 V but it's said to be suitable for 3-4x Li-ion, not just 4x Li-ion. Also, the claimed input voltage is 5-12 V but it's said to be suitable for 4x Li-ion, not 2-4x Li-ion. However, the subtitle mentions 12-15V. 5 26 mm 5 modes in Impractical Reverse Order; high, medium, low, strobe, SOS. Buyer beware. Unknown output voltage. Intended for use with a Cree MT-G2 but that LED is available in three voltage options - 6V, 9V and 36V. The claimed 18V output doesn't make sense. (The MT-G2 does have an 18W power rating.) If the 1000mA output current is correct this could only suit the 6V or 9V versions, as the 36V version is rated for 500mA. 3 21 mm x 23 mm high - two boards in double layer Driver removed from site. 3 modes with memory; high, medium (30%), low (5%). PWM frequency 3.9 kHz. Thermal and low voltage warnings. Bottom board apparently does nothing except provide a 21 mm board and can be removed to leave just a 19 mm single board boost driver, 10 mm high, with components on both sides. 8 28 mm x 20.3 mm Buck regulator. Constant current out 1000 mA (user reconfigurable, 350 mA default) at up to 25 V, uController UI. 3 19 mm 3 modes; low (10%), medium (50%), high (100%). 1 63 mm x 21 mm x 33 mm Linear regulator with a heatsink, available in six versions providing 350 mA, 700 mA, 1000 mA, 1.4 A, 2.0 A and 2.8 A. Large input voltage range (the minimum input voltage of 1 V is assumed) but input voltage must be at least 1 volt above output voltage and a maximum of 22, 13, 9, 7, 6 or 4 V above output voltage for the respective versions. The mention of PWM is believed to mean this driver can be used with a separate PWM driver, not that this driver uses PWM. Has thermal protection and output short circuit protection. Also available in SLIM versions which lack the heatsink and so have tighter input voltage tolerances. 1 50 mm x 7 mm x 15 mm Linear regulator, available in eight versions providing 180 mA, 350 mA, 500 mA, 700 mA, 1000 mA, 1.4 A, 2.0 A and 2.8 A. Large input voltage range (the minimum input voltage of 1 V is assumed) but input voltage must be at least 1 volt above output voltage and a maximum of 10, 10, 7, 5, 4, 3, 2.5 or 2 V above output voltage for the respective versions. The mention of PWM is believed to mean this driver can be used with a separate PWM driver, not that this driver uses PWM. Has thermal protection and output short circuit protection. Also available in non-SLIM versions which have a heatsink, allowing better heat dissipation and wider input voltage tolerance. 1 38 mm diameter (flanges 64 mm long) x 13 mm height Input voltage must be at least 2 V higher than output voltage. Output has short circuit protection (15 seconds) and open circuit protection. Versions available with outputs of 350, 700 or 1,000 mA. 1 83 mm x 51 mm x 16 mm This is a DC-DC converter using an LM2596 with a constant 5 V output, not a current controlled LED driver. The maximum output current is 3 A. 1 17 mm x 14 mm x 10 mm Photos show PT4115 chip with SS24 Schottky diodes (including the rectifier). Sense resistors appear to be 1 Ω and 0.15 Ω in parallel. 1 110 mm x 64 mm x 25 (or 17) mm Four channel driver (using four BuckPucks) with independent dimming (140-1100 mA) on each channel (thus up to 4400 mA total). Dimming controller (eg, PC) sold separately. PCB length 102 mm but two connectors hang over the end. 15 96 mm x 57 mm x 25 mm Three channel, maximum 3 A per channel. WiFi controllable using a cellphone. 4 27 mm x 27 mm x 30 mm Unknown regulation method. Output power 1.5 W; output current listed in this table is assumed total. Stated dimensions are probably for each LED housing. 4 white LEDs included (in 4 water resistant housings). 15 115 mm x 14 mm x 12 mm RGB controller; regulation unknown, could be simple resistors. Output power 1.5 W; output current listed in this table is assumed total. Includes RF remote control. 12 red LEDs, 12 green LEDs, 12 blue LEDs included (in 4 water resistant housings). 1 17 mm The driver chip shown in the photo is the discontinued PT4105. 3 17 mm double sided board Driver has vanished from site. Buck driver using PWM for modes. Three modes; low (5%), medium (35%) and high (100%), includes mode memory. Not constant current (the output changes with input voltage) but is claimed to push a SSC P7 "very hard" and thus needs good heatsinking. Thermal protection may have been removed in the latest version. Appears to be the same as KD sku S005296. 5 17 mm Stupidly, this driver completely vanishes from the retailer's web site when temporarily out of stock. Buck driver using PWM for modes. Modes are high (100%), medium (45%), low (10%), strobe, SOS. Includes mode memory. The claimed output appears very unregulated, with a fresh Li-ion giving 2.38 A, and dropping to just 1.1 A. 1 14 mm Buck regulator. Constant current output, board available as a "blank" (add one or two SMT set resistors), or preset to 400 mA, 500 mA, 750 mA, 917 mA, or 1000 mA. DD when Vin less than Vf. Has thermal protection. 1 30 mm x 20 mm x 13 mm Output voltage 3.0-3.6 V. Output current stated to be 300/600 mA. This is a strange one. An MR16 driver with three wires (red=positive, white=negative, black=???) is pictured as well as a driver board with empty spaces for red, green and blue LEDs. It is stated to be compatible with MR16 bulbs but apparently requires 12 V DC input. My best guess is that the MR16 driver is a constant voltage supply for a linear regulator RGB driver (AMC7135 with PWM?). 6 25 mm x 11 mm high Available directly from a CPF member. There is a single mode version (€20), a 4-mode version (100%, 70%, 25%, 3%) and a 6 mode version (as 4 mode plus Fade in/out, Strobe). External momentary switch needed to change modes, not included. Sadly the specs are not all in one place, but it appears it may be able to cope with more than one LED, has a mode memory, and has a typical efficiency of about 85%. 1 23 mm - two boards in double layer 5 modes; high, medium (~50%), low (~5%), strobe, SOS. Comes with a warning about the heat. One poster points out it looks very much like KD sku.S007542. Another poster's test results are the source of the mode output percentages, and has maximum output just 3.28 A instead of the claimed 5 A. That poster may also have been saying he could only get 3 seconds on high mode before thermal protection cut in. Buyer beware. Some efficiency test results are posted here (with a 4.93 A output current). 5 26 mm 5 modes; high, medium, low, strobe, SOS. Output current claimed to be a maximum of 9 A, implying either it's not well regulated or there's a bit of variability between drivers. 3 37 mm 3 modes; high, middle, low - no flashing modes! Output current claimed to be a maximum of 9 A, implying either it's not well regulated or there's a bit of variability between drivers. 5 25 mm x 25 mm x 11 mm 5 mode; high, medium, low, fast strobe, SOS. Square board. 1 17 mm Buck driver, not a linear regulator as claimed. 5 mode; high, medium, low, strobe, SOS. Test data shows steady 2.2 A, not the claimed 2.4 A. However, the test data is rather dodgy - if tested even with a low Vf LED like an XM-L the driver would be up to 168% efficient - buyer beware. It seems like a pretty good driver but the current drawn will be considerably higher than indicated. 1 17 mm The same driver as DX 26110 (even uses the same photos) but this one is more expensive. 1 17 mm April 2015: Also available from Lights Castle 530011 for a little more. April 2011: AX2002 driver chip used again (which has a minimum input voltage of 3.6V in its specs), with SS34 Schottky diode and 0.2 ohm sense resistor. (Add 1 ohm resistor in parallel to increase output to 1.5 A.) The input capacitor is said to be only rated for 16 V. Red board. Or green board (my very next order just after getting a red board). See AX2002 footnotes for using as a voltage regulator. November 2010: This driver may have changed again, with the YB1682 voltage regulator chip being used. Not good. Previous version (Feb 2010): Regulator chip AX2002 with 0.2 ohm sense resistor gives output 1.25 A, and the SS34 Schottky diode is great if you want to bump up the output current. DX's description claims it provides different current outputs (1-1.2 A) to different Cree efficacy bins. I think NOT. Tests with the previous version showed a constant 1.10 A, which was very close to the theoretical 1.13 A of an AX2002 with the then 0.22 ohm set resistor. When multiple drivers are used in parallel the efficiency apparently drops, probably because one driver is doing most of the work (and so gets quite hot). Hence, these drivers should probably not be run in parallel. Every so often the regulator chip changes, and in the case of the AX2002 had its identifying marks removed. This is quite frankly silly, as DX's customers went through another round of not only figuring out what the specs for the board were, but working out what the new chip was as well, before they could figure out the board's specs. The driver chip was suspected by some to be MC34063A (not an obvious choice by any means as the chip isn't pushed as an LED driver and the claimed similarity to a certain reference design doesn't exist), YB1682 (has a different reference design - not surprising because it's a voltage regulator not a constant current driver), PT4105 (unlikely because production of that chip was terminated before this board was listed), PT4115 (unlikely because of reported working voltage range) or AX2002 (perhaps most likely; the board appears to be the reference design except for choice of some components, and my chip has part of an A still showing). Tip 1: The output current can be increased (or decreased) by changing the set resistor appropriately: I(LED)=0.25V/Rsense. The diode in the product pic is a Schottky SS24, which has a maximum current limit of 2 A, but as of Feb 2010 are shipped with a Schottky SS34, with a 3 A limit. The AX2002 driver chip has a 2.5 A limit and gets very hot over 2 A. Tip 2: Maximum efficiency is achieved when running multiple LEDs from one driver with just a few excess volts (eg, 4 LEDs with 5 Li-ion). Last updated 8 Nov 2017. 3 17 mm - two boards in double layer Buyer beware. Unknown regulation method, assumed to be buck because of input voltage range, which is listed as two different ranges in the title and description. Conflicting specs. Driver chip is marked LEDA 0712 (Vsense probably 0.25 V), with Schottky diode SS34. Three modes (presumably using PWM); claimed high 800±50 mA but tested to be 1100 mA, low 200±20 mA, fast strobe claimed 400±50 mA. Output current may vary by battery voltage. Efficiency improves from 80% to 88% if sense resistor is changed to lower the output current. Although specified for use up to 8.4V it apparently works with 12 V with 2 LEDs (simulated) and the efficiency can be increased to 90% at 1 A output with a mod. Claims to provide different current outputs (1-1.2 A) to different Cree efficacy bins. I think NOT. Also claimed 0.8 A output. Buyer beware. Apparent alternate source is Lights Castle 530005. 3 17 mm Buyer beware. Photos are of a 2x AMC7135 driver but specs do not match. Specs are also inconsistent, with a claim of different currents for different luminous flux bins. Input voltage claimed to be 3.0-8.4 V and 5-12 V. Output current claims of 0.8 A, 1 A, and 1.2 A. Probably the same as DX 25517 which is a double layer driver. 5 17 mm April 2015. Photos have been changed - buyer beware. No longer two boards in double layer. Purchasers in April 2010 reported receiving a 3 mode board (compare with DX sku.26111) - buyer beware. Unknown regulation method, assumed to be buck because of input voltage range. 5 modes (presumably using PWM), high 1200±100 mA, mid 550±50 mA, low 100±10 mA, fast strobe 650±50 mA, SOS 1200±100 mA. Claims to provide different current outputs (1-1.2 A) to different Cree efficacy bins. I think NOT. Alternative source Lights Castle 530008. 3 17 mm x 6 mm high - two boards in double layer Buyer beware - specs claim different output current for different luminous flux bins. 3 mode with memory; high, low (100 mA), fast strobe. Apparently the same as DX 26111. 3 17 mm - two boards in double layer A board purchased in March 2010 reported to be 5 mode and with a maximum output current 800-950 mA (compare with DX sku.26107) - buyer beware. Unknown regulation method, assumed to be buck because of input voltage range. Driver chip is marked LEDA 0712. Three modes with memory; claimed high 1,200±100 mA, low 100±10 mA (bad flickering reported from very low speed PWM), fast strobe 650±50 mA. One reviewer mentioned the mode order is a crazy low, strobe, high. Output current may vary by battery voltage. Claims to provide different current outputs (1-1.2 A) to different Cree efficacy bins. I think NOT. Apparently the same as Lights Castle 530012. 5 17 mm x 6 mm high - two boards in double layer Buyer beware - claims different output currents with different luminous flux bins. 5 mode with memory; high, medium (550 mA), low (100 mA), fast strobe, SOS. Alternative source DX 26108. 5 17 mm - two boards in double layer Update June 2012: There may be a bad batch of these. They are reported here to eat LEDs. Unknown regulation method, assumed to be buck because of input voltage range. Spec claims 5 modes (presumably using PWM), with memory; claimed high 1200±100 mA, mid 550±50 mA, low 100±10 mA, fast strobe 650±50 mA, SOS 1,200±100 mA. However, one user has posted that with 4x AA NiMH the steady modes were high 700 mA, medium 300 mA, low 60 mA (insufficient voltage?). Claims to provide different current outputs (1-1.2 A) to different Cree efficacy bins. I think NOT. Alternative source Lights Castle 530009. 5 17 mm x 6 mm high - two boards in double layer Buyer beware - claims different output currents for different luminous flux bins. 5 mode, no memory; high, medium (550 mA), low (100 mA), fast strobe, SOS. Alternative source DX 26107. 5 32 mm x 28 mm high - 2 perpendicular boards Buyer beware - title says TR-0124, photo shows TR-0163B. 5 modes in Impractical Reverse Order; high, medium (2 A), low (800 mA), strobe, SOS. Polarity protection. Alternative sources DX 50026 and Lights Castle 530014. 5 35 mm x 35 mm x 25 mm Buyer beware - model number in photo different from model number in specs. Unknown input voltage range. 5 mode; high, medium (2 A), low (0.8 A), fast strobe, SOS. Alternative source DX 50026 and Fasttech 1424817. 5 26 mm x 26 mm high - two perpendicular boards Five modes in Impractical Reverse Order, unknown memory; high (4 A), medium (2 A), low (0.8 A), strobe, SOS. Claimed to be 10 W input power but with a 4 A output current that's not going to be true with a white LED. 5 26 mm x 22 mm x 21 mm Buyer beware - model number in photo different from model number in specs. Minimum input voltage is a guess. 5 mode; high, medium (2 A), low (0.8 A), fast strobe, SOS. Version 2: TR-0163B. Two green boards perpendicular to each other. Unknown if size has changed. Version 1: TR-0124-A. Double layer, red boards. 3 17 mm 3 mode with memory; high, low, strobe (8 Hz). Polarity protected. 3 20 mm x 17 mm high - two perpendicular boards Buck driver - buyer beware on the specs and vertical size. 3 modes; high, low (200 mA), fast strobe. See DX 25516 for more details. 3 20 mm x 17 mm high - two perpendicular boards Update Jan 2016: It's a buck driver possibly using the QX9920 LED driver chip, not buck/boost as implied by the specs - buyer beware. Battery contact board is labelled TR-0192A and perpendicular board is labelled TR-0192B. The specs given for this driver imply that it'll output 10.8 V with anything from 5 V to 12 V input. This seems very doubtful at this price point - it would mean it was boost/buck. It's very likely boost only, and goes direct drive when the input voltage is greater than the output voltage; the output current is said to rise rapidly and it gets very hot. Alternative source Lights Castle 530004. Updated version May 2013: About 20 mm high; two perpendicular boards. Upgraded switching FETs and much larger inductor. Old version: 14 mm high; two boards in double layer. Uses the FP5138 boost driver chip. 3 modes - claimed high 800±50 mA, low 200±20 mA, fast strobe 400±40 mA. However one reviewer has claimed the modes are high 900 mA, low 600 mA, strobe 600 mA, and another says they are now 750 mA on high (as of 12/2009). Mode memory switches to the next mode whenever turned on again. Apparently has a battery protection function which disables high mode when battery cannot supply enough current. Input current may be as high as 4 A at 5 V. The efficiency figure listed in this table is from a particular configuration in the driver chip datasheet. YMMV. Tip: The driver board is the top board (17 mm diameter, with the inductor on it) and can be separated from the lower board if only one mode is wanted. It has set resistors on its underside which can individually be changed to alter high and low modes. Last updated 14 May 2018. 5 26 mm diameter x 22 mm high - two boards in double layer 5 modes with memory; high 4 A, medium 2 A, low 800 mA, fast strobe 2.8 A, SOS 4 A. Incomplete specs for input voltage. Last updated 22 Aug 2013. 5 17 mm Driver uses at least four AMC7135 chips on one of two back-to-back boards, and probably an ATtiny13 on the other board. Five modes - high (100%), medium (45%), low (10%), strobe, SOS. Claimed constant current, but the maximum output is variously listed as 3.0 A and 3.5 A, and test results listed show the output is definitely not constant over the voltage range tested (and has a high of 3.3 A). This calls into doubt the constant current claim for all drivers from this retailer. Buyer beware. See extra AMC7135 notes below. 1 17 mm The whole site this driver was on has gone. Discussion here claims it does no current limiting other than PWM. Output current can be adjusted to one of 500 mA, 1 A, 1.5 A, 2 A by soldering/unsoldering four parallel set resistors. Specs claim it is "Most efficient when the LED's Vf is similiar to Input Voltage." I wonder who came up with the weirdo name. 1 16 mm Five modes, cycling; high, medium (30%), low (5%), fast strobe (8 Hz), SOS. Probably not suitable for torch use due to non-standard supply contacts on back of board. Diameter stated to be 16.5 mm but dimension listed is 16.0 mm. Unknown regulation method. 5 22 mm x 10 mm high Five modes without memory; high, medium (50%), low (10%), fast strobe (8 Hz), SOS. Polarity protection. Unknown PWM frequency, eh! 1 34 mm x 20 mm Output current continuously adjustable from 5 mA to 1000 mA using on-board potentiometer. Unknown regulation method. Switch is momentary, turns driver on or off with each push. Stand-by current 10 µA. 3 22 mm 3 mode without memory; high, low (20%), fast strobe (8 Hz). A momentary switch (included) cycles through modes. 3 22 mm 3 modes, through which you have to cycle to turn it off; high, low (20%), fast strobe (8 Hz). 5 22 mm 5 modes in Impractical Reverse Order; high, medium, low, strobe, SOS. 5 22 mm 5 modes in Impractical Reverse Order; high, medium, low, strobe, SOS. A review says the actual output current is 2.5A. 1 22 mm A review for the 5 mode version (FT 7492700) says the actual output current is 2.5A. Unknown if the driver is actually dimmable as claimed in the title. 5 22 mm 5 modes in Impractical Reverse Order; high, medium, low, strobe, SOS. The single mode version (FT 7217201) is not 4 A output current as claimed. direct drive with 2x Li-ion. Efficiency of about 75%. 1 22 mm Not 4 A output current as claimed. Direct drive with 2x Li-ion, but output reasonably steady above ~8.0 V. Output flickers slightly when regulated output takes over from direct drive. Efficiency about 75%. 1 26 mm Claimed 4.5A output current but one user reported an output current of 3.5A but doesn't say what conditions that was measured under. Another user suggested the output current might be input voltage dependent. 5 26 mm Output current is stated to be 4.0-4.5 A. 5 modes in Impractical Reverse Order; high, medium, low, strobe, SOS. Incomplete specs provided, so actual output voltage range unknown. 5 26 mm 5 modes in Impractical Reverse Order; high, medium, low, strobe, SOS. Claimed 4.5A output current but the single mode version (7217101) has some forum comments indicating the output current is only about 3.5A. 1 26 mm Output current is stated to be 4.0-4.5 A. Incomplete specs provided, so actual output voltage range unknown. Unknown if the driver is actually dimmable as claimed in the title. 5 32 mm Output current is stated to be 4.0-4.5 A. 5 modes in Impractical Reverse Order; high, medium, low, strobe, SOS. 1 30 mm Buyer beware. Apparently intended for RGB (3x1W) LEDs but only the cathode solder pad for the green LED has solder on it. Many important details lacking. Appears to have an IR sensor. 1 22 mm 3 modes; high, low, strobe. Polarity protection. 3 21 mm x 15 mm high Driver removed from site. Three modes; high, medium (30%), low (5%). PWM rate 3.9 kHz. Thermal protection, low voltage protection; flashes to indicate both of these. 5 17 mm (two boards) 5 mode with memory; high, medium, low, fast strobe, SOS. Low voltage warning, low voltage protection. 8 20 mm Buck regulator based on Zetex C310 chip and PWM for modes. Output 800-1000 mA on high. Modes 100%, 50%, 30%, 20%, 10%, SOS, strobe, fade in & out (one of very few to have that). With 4x NiMH cells the ability to select modes is lost about when the cells need to be recharged. No reverse polarity protection. 1 14 mm x 11 mm x 6 mm Maximum output power ~15 W. Polarity protection. Dimming by PWM signal or DC. Maximum claimed efficiency listed here; typical efficiency for any particular configuration unknown. 1 14 mm x 11 mm x 6 mm Maximum output power ~15 W. Polarity protection. Dimming by PWM or DC inputs. Maximum claimed efficiency listed here; typical efficiency for any particular configuration unknown. The PT4105 which the manufacture has already officially stopped producing,and the subsequent instead item is the PT4115,AX2002 and FP6101 Also,The PT4115,AX2002 and FP6101 has superior performance over ,wider input range and more current than the PT4105. While I look forward to the PT4115 being available in low cost LED drivers (by its numbering the apparent successor to the PT4105), I note that it needs an input of at least 8 V (and has under voltage lock out at 6.8 V), so isn't nearly as well suited to low voltage torches as the PT4105 was. It will, however, have its uses for 3x Li-ion torches and automotive purposes. The chip has a DIM pin which gives it the ability to very easily be dimmed. Efficiency is about 80-82% for 1 LED, up to 93% for 3 LEDs, and apparently up to 98% for 7 LEDs. Maximum output current 1.2 A. This driver chip from AXElite looks extremely interesting. It will accept a minimum 3.6 V input and has a maximum switched current of 2.5 A, although it tends to overheat at more than 2 A. It includes thermal protection (140°C), over current protection, short circuit protection, and has a PWM control circuit. Its efficiency is good too, with an output of 2 A @ 5 V it's an impressive 91% efficient (with 12 V input). Driving a Cree XR-E at 1 amp will give an efficiency of about 87-88% (with 12 V input). Efficiency is not quite as good at low currents with a single LED, dropping under 80%. AX2002 drivers can also easily be configured as a constant voltage power supply. The load is connected straight to ground and the 0.25 V reference voltage is used to control a voltage divider with a couple of moderately high value resistors to give a fixed multiple of 0.25V at VOUT. For example, for 5 V, 5 = 20 * 0.25, so a 10 kΩ resistor is placed between ground and FB (the feedback pin), and a 190 kΩ resistor between FB and VOUT (making the total of those resistors between VOUT and ground of 200 kΩ). When used in this way, to give stability the current through the resistors probably just needs to be comfortably greater than the feedback pin bias current of (0.1 µA typical, 0.5 µA maximum). If two exact resistor values for the voltage divider are not available it's easiest to use a single resistor for the sense resistor (between ground and FB), while the other value (between FB and VOUT) uses two resistors in series or parallel. For series, one of those two resistors will be as close as possible to the desired value, and just under it, while the other will be a much smaller resistor to tweak the total resistance up for the output voltage wanted. For parallel, the main resistor is just over the actual value wanted while the other resistor with about ten times the resistance tweaks the total resistance down. If that resistor is getting into megaohms you should probably revise your values. Some AX2002 drivers (such as DX 3256 sadly no longer an AX2002 driver) come with a 1 A Schottky diode, which will need to be changed if increasing the output current over 1 A. See the Schottky diode notes below for links. The AX2002 also has a big brother, the AX2003, which has a maximum switched current specification of 4 amps – easily enough to drive a Seoul P7, or a Cree MC-E with the dice in parallel. No drivers with the AX2003 are presently known. The spec sheets of the AX chips could do with a few more graphs showing how constant the output current is, etc. FP6101 (datasheet): Not an LED driver. Chinese LED driver, 1 A maximum output current, 6-35 V input, 0.1 V high side sense voltage. Claims to be able to provide up to 35 W output power. Dimmable with 0.5-2.5 V PWM signal. So there are some nice driver chip options, but it still leaves a gap of a high efficiency, really low voltage, low current driver.